We all do it. Accumulating unnecessary junk is as American as a DVR taping of Storage Wars. “Stuff happens,” they say, and no one knows how. One day we check the garage and scream for help. In response, neighbors run to our aid to buy our picture frames on the front lawn. My wife and I just got back from a short stint in California. We’ll soon undertake a thirty-five hour road trip across the United States from Coeur ‘d Alene, Idaho to Rochester, New York—where we’re moving to. We’re here in Idaho, our pseudo homebase, to situate the stuff we left behind. Our goal is to fit all of our belongings into one car load—specifically, a traveled Toyota Prius. No big deal. What did we leave behind? One, two boxes? “Storage,” I heard my Mother-in-Law say. Not impossible. Totally embarrassing. We had more ffuts than we realized. People naturally respond to their upbringing in one of two ways: unapologetic acceptance or spiteful opposition. I hate stuff; I always have. It weighs you down and gets dusty. No thanks. The house I grew up in was dominated by stuff, my Grandmother and her books and antiques and collectables. She isn’t a hoarder, by any means, but she’s getting there. Pre-med is a good term. In truth, my grandmother is a wonderful woman with a heart of gold, and I’ll be forever grateful of the upbringing I was given. That said, she could stand to get rid of one or two, or twelve or fourteen, boxes. My wife had a similar upbringing. When we married, we agreed stuff would never be an issue. To us, clutter is a symptom, a sign of disease, and a storage-unit the sickness. When I heard the s-word the other day, my stomach turned. The storage unit took two full truck loads to unload. Good Lord. Rummaging through, I opened a “childhood box” and found my old Sega Genesis. I smiled, remembering my ten-year-old self playing “Sonic.” I soon realized the cables, controllers, and games we’re all missing. In true hoarder fashion, I’ve been holding on to a useless Sega Genesis console for 16 years. Why? Why would I hold on to this? I could’ve sold it for $20 ten years ago; the other day, I literally placed a $2 sticker on it. The worst part? It didn’t even sell. I still have it! Yes, some things worth holding onto—priceless, family heirlooms come to mind—but the Sega Genesis console, or the WWF flag from the toy wrestling ring, probably deserve a second look. I spoke to my brother in-law the other day about this issue. Eventually, Buddhism and the act of “letting go of material possessions” came up. We also spoke of Jesus. To me, the principle of “letting go” seems just as Christian as it is Buddhist. Jesus talked about living for each day, like the sparrows. He told people—not everybody, I know—to get rid of their stuff, to not worry. He spoke about having two cloaks and giving the other one away. It’s time to come to terms. It’s time to get rid of my ffuts. Seriously, what’s up with all the cloaks, people? 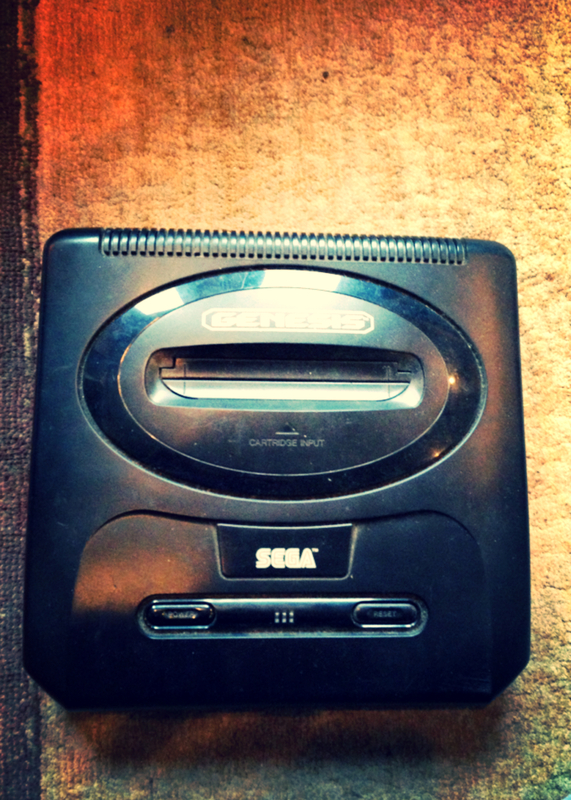 More importantly, does anyone want a Sega Genesis console? My price just went down. Dude! Sonic on the Genesis?!? Awesome! That takes me back, too. I’m with you on trying to get rid of stuff. I’ve been on a quest of throwing stuff away, giving stuff away and selling stuff for awhile now, and with a houseful of kids…whew! I can’t imagine all the stuff that gets accumulated with a house full of kids. Best of luck! One word. Flylady. She really GETS “stuff”, what it means, what it does to us. My study is my dad’s book room and I am quietly clearing things off the floor and onto shelves … But not throwing stuff away because it’s not mine, even though this is my house too! He still has doodled-on lecture notes from before I was born. He’s brought it with him when he’s moved house, at least twice. For God’s sake, why?!!?! currently have a double garage that its impossible to fit a car in, because its full of stuff… and my study/office is shrinking by the week as the stuff accumulates around me… but its all ‘important’, honestly. good thoughts as always, and a pleasure to read. Oh, and letting go of stuff is definitely just as much a Christian thing as a Buddhist thing, you tell your brother-in-law I said so. HA! Tony. I can only hope you ate some. No. I’m bold, but not that bold. It went in the compost bin.